Plum grape seed and sea buckthorn face mist –Review. Facial mist are a thing now. You need to feel fresh and hydrated? Spray a facial mist! Need to fix your cakey foundation? Facial mist! Need to fix your broken highlighter? Facial mist it is! 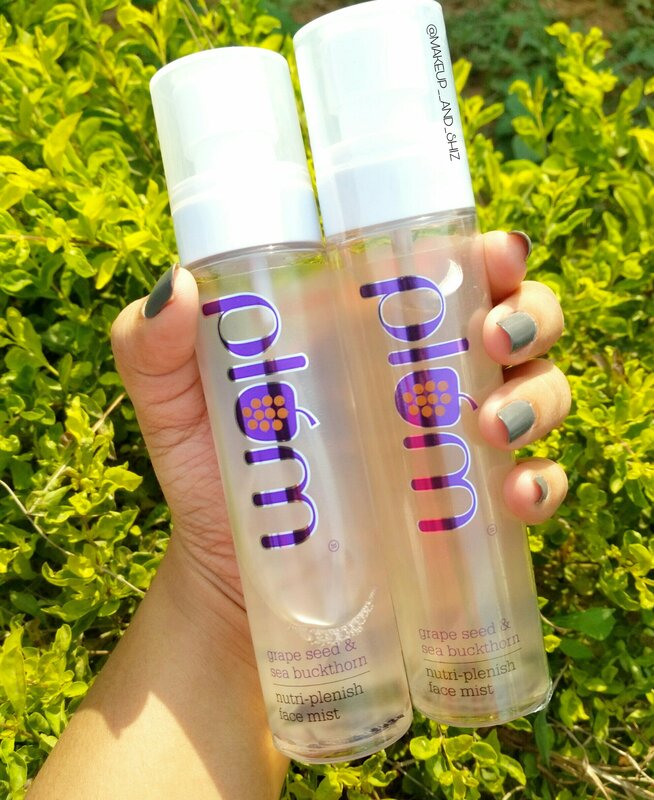 Hence, I will be reviewing the Plum goodness grape seed and sea buckthorn nutri – plenish face mist! It is available in Amazon, Nykaa, Plum Goodness , Flipkart and Purplle ( Click on the hyperlinks to get to the product directly ) . MRP- Rs 360 for 100 ml. Read about : FABEYA BioCare Natural Organic Coffee Gel – Review. It comes in a clear plastic bottle and white cap. It has white nozzle spray. I totally love the packaging since you can see clearly how much you are using and how much if left. Also the fact that you can always reuse this bottle is great! These are travel friendly too! Yaay to that! Well, to start with, I wasn’t that happy after using it after a week or so. But gradually as I used more, I started liking it and I couldn’t stop using it. It is hydrating, not super hydrating though. I generally use this right after facewash or cleanser , when my face is semi dry. I spray this all over my face to lock the water content ; like a toner and then go in with serum or moisturizer. If you think this is enough as a moisturizer , nope. You will still need moisturizer. It has a tingling sensation after spraying it all over the face. It doesn’t leave your face sticky. It has a strong fragrance, which is sweet.I use this when I am in a hurry. Spray four times to cover your whole face. It does work good as a makeup setting spray. Use it as toner after using facewash or use it as a last step in your skincare routine to give extra plump effect. Read Also :Dot & Key Underarm Colour Correction Serum– Review. Yes and I already have! Yes, it’s a decent face mist , specially for the price it is offering for. It will be great for all skin type in winters, yes oily skin too. Fragrance can be too strong for some people. That is all for this post ! Do comment down and let me know if you use any facial mist ? Next FABEYA Cocoa Butter Cream — Review.